I am happy to let you know that my image below, taken in the forests in Kuhmo at the Finnish-Russian border, is honored with a Highly Commended Award in BioPhotoContest 2017. 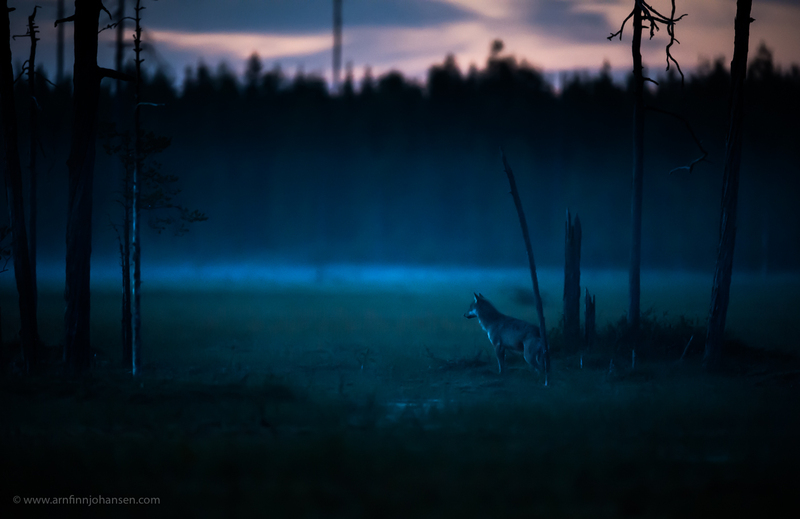 The image shows a peaceful and wild male wolf photographed in the summer midnight. This is the kind of simple composited image I like to create, emphasizing how lucky we are to be given a small glimpse into the wolfs’ secret life. Thanks to my good friends Sami and Lassi Rautiainen at Wild Finland for giving the possibility to experience free roaming wolfs on the Finnish-Russian border in Kuhmo. BioPhotoContest is hosted by BioArtVisual Association based in Italy. In their 4th year; 2017, the contest received 2,050 images from photographers representing 20 countries. The overall contest theme was “The Boreal Forests”. The Boreal Forests of the planet are located in the northern hemisphere and form a wide band encircling the northern areas of the American, Europe and Asia continents. Click on the image to enlarge and have a closer look. Wolf in the summer midnight. Highly Commended at BioPhotoContest 2017. Nikon D4s, Nikkor 400/2.8E, 1/50 sec at f/2.8. ISO 6,400.